It isn’t often that we can say a new release is out co-written by 2 authors featured here on the Showcase, so to bring to your attention one co-written by 3 – yes, THREE – makes us very proud! Wonderfully described as “THE WALKING DEAD AND HELL ON WHEELS COLLIDE!” this is one to pick up without delay. With further instalments imminent, isn’t it about time you headed DEAD WEST? September, 1868…SOMEWHERE IN THE SIERRA NEVADA, during the expansion of the Central Pacific Railroad, Nina Weaver and her pa, Lincoln, trundle into Coburn Station with a wagonful of goods they’re looking to barter. Of all the rotten luck, their world—and the future of the American West—is forever changed when a sudden swarm of zombies invades town on the hunt for some human-sized vittles. 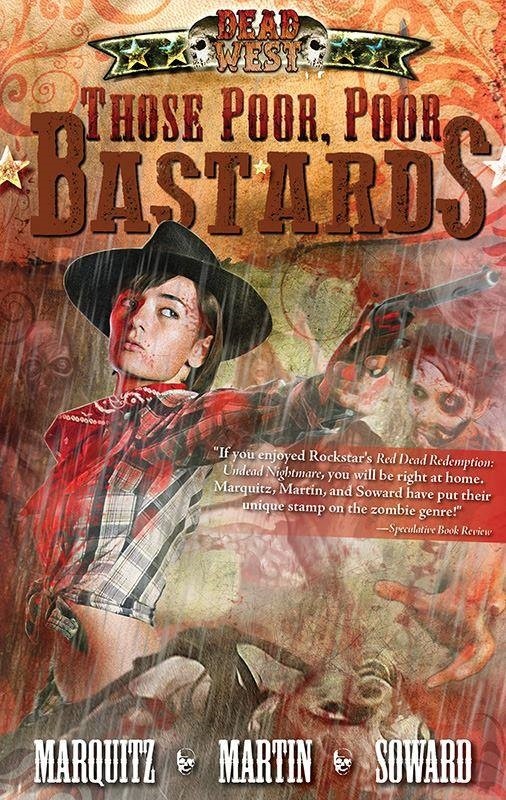 THOSE POOR, POOR BASTARDS is the first volume in the all-new Old Western Action-Horror series, “Dead West.” From the deranged minds of Tim Marquitz, J.M. Martin, and Kenny Soward.